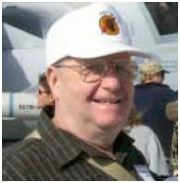 Jack made two Westpac cruises aboard the USS Midway, one in 1961 and one in 1962 http://www.fisthistory.org/Peace.htm. He was serving in VA-25 at the time. I received the following from Chuck Muhl who served with Jack in VA-25. "I flew with Jack in VA-25 aboard the Midway CVA-41 from 1959 until I left the Navy in 1962. During that period personal call signs or handles like Top Gun's "Maverick" were not yet in vogue as they later were to become. As you most likely know the Midway is now a museum in SanDiego and they will be opening up a tour of the carrier's Ready Rooms. VA-25 formed an association circa 1996 called The Fist of the Fleet Association www.fistofthefleet.org and they in turn have joined with a Light Attack group to help support the display. Each Ready Room had a board attached to a wall that was a list of each pilot from the squadron C.O. on down to the lowly "nugget" newbie. There followed each name a line of squares and each time the pilot made a carrier landing, the Landing Signal Officer would grade it and color in the square Green, Yellow or Red depending on how the pilot flew the pass and trap. Green OK to red hairy and yellow somewhere in between. It was there for all to see as the cruise progressed. Kind of like having your report card passed around for all to see. I wanted to memorialize Jack in a small way by having his name put on Ready Room 3's "Greenie Board" as we called it. There is a space along side his name for his call sign. If you knew what it was with VA-152 would you please e-mail it to me and I will have it added to his name." "I have attached the proposed "Greenie Board" that has been firmed up as far as names/squadron and call signs. This board will be displayed in Ready Room 3 aboard the USS Midway. It will be another memorial to Jack. I've attached a Polaroid of Jack standing up in our ready room with Lynn Hughes also standing who was Jack's T-28 instructor at North Whiting. That may be Susanne sitting down in front of Jack. 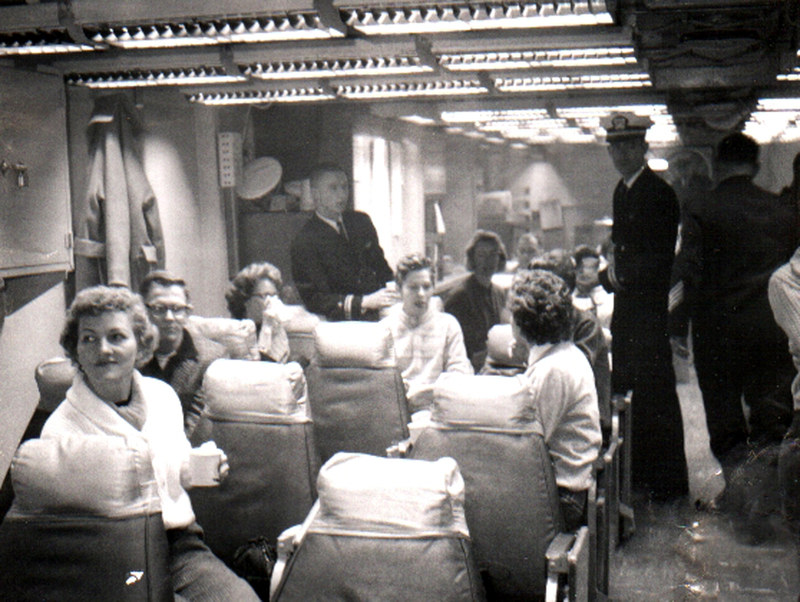 It was a Midway Dependent's Day Cruise." Jack is standing in the back left and Suzanne is sitting in front and to the left of Jack. 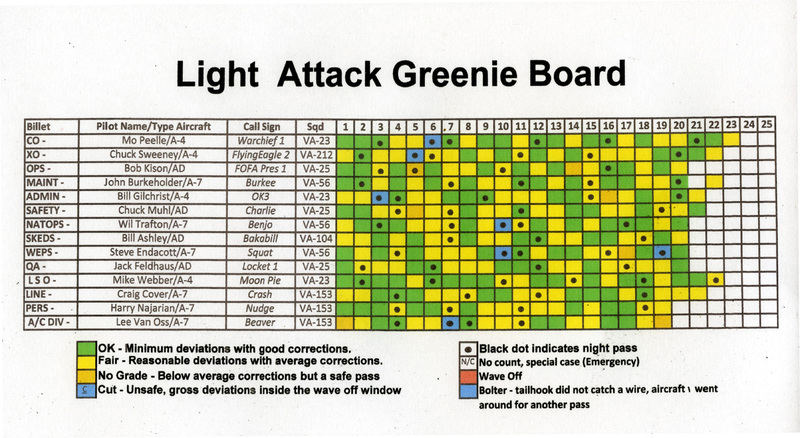 Below is the "Greenie Board" that is on display in Ready Room 3 aboard the Midway in San Diego. So far, four ready rooms have been restored - although there will be continuing progress for quite a while. Ready Room 3 has been established as the “light attack” RR to depict the role that the A-1 , A-4 and A-7 played in Midway’s history. Our own squadron, The Fist Of The Fleet, has a very prominent display in the Ready Room with several pictures of our aircraft, several logo items, and three members of VA-25 are listed on the “greenie board” - Bob Kison, Chuck Muhl & Jack Feldhaus. 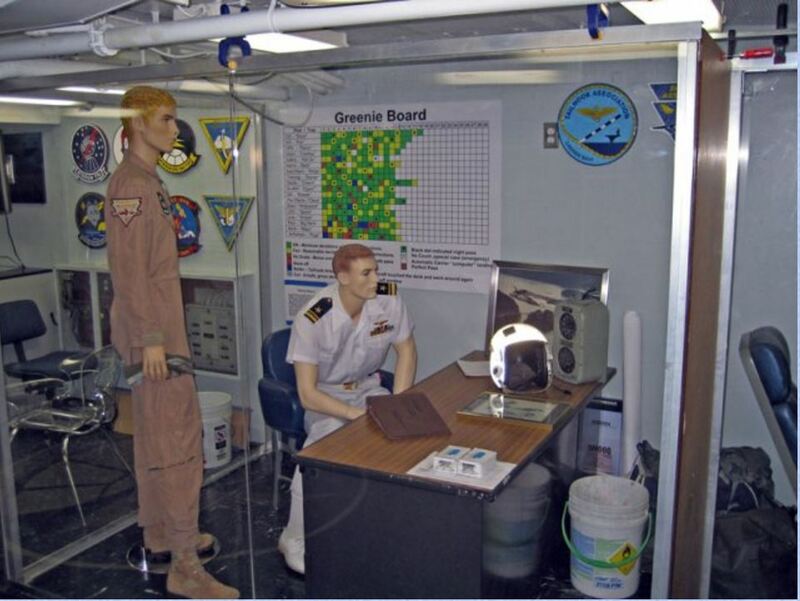 Below is a photo of the Ready Room on the USS Midway Museum showing the Greenie Board on the wall. The photo came from the museum web site on 21 March 2017. Following is a list of links of interest. Link to USS Midway information and free reading of all ship's cruise books.